Halsway is delighted to present this extraordinary tutors’ concert as part of a weekend course exploring Appalachian music and song, and celebrating the centenary of Cecil Sharp and Maud Karpeles’ songhunting expeditions to the mountains. Two outstanding American musicians Anna Roberts-Gevalt, singer, fiddle and banjo player with the sensational duo Anna & Elizabeth, and Jeff Warner, one of the most respected and entertaining performers of traditional song in the USA will be appearing tonight. 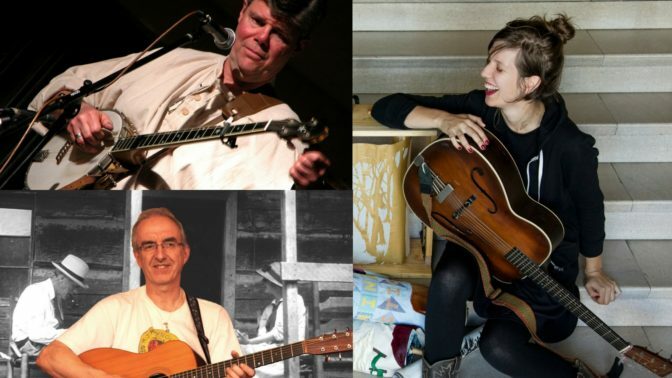 They are joined by singer and multi-instrumentalist Brian Peters for an evening of Appalachian balladry and music. Brian Peters is an expert on traditional songs from both sides of the Atlantic, a fine singer and player of guitar, fiddle and banjo. He’s worked with leading American musicians Sara Grey and Jeff Davis, and performed the acclaimed ‘Sharp’s Appalachian Harvest’ at US festivals, concerts and The Library of Congress, Washington D.C. He’s also tutored at Appalachian summer schools including Augusta Heritage Center and The Swanannoa Gathering. Jeff Warner is among the US’s foremost performer/interpreters of traditional music. His songs from the lumber camps, fishing villages and mountain tops of America connect 21st century audiences with the everyday lives–and artistry–of 19th century Americans. He plays concertina, banjo, guitar and several “pocket” instruments, including bones and spoons. Jeff is a founding officer of Folk Alliance International, a producer of the Portsmouth (NH) Maritime Folk Festival and past president of the Country Dance and Song Society. In 2016, CDSS honored Jeff’s dedication to the world of traditional folk music with their annual Lifetime Contribution Award. Anna Roberts-Gevalt is a baltimore-based traditional fiddler & banjo player, composer, educator, folklorist, storyteller, shadow puppeteer, filmmaker & illustrator. She is lauded for her work with the duo Anna & Elizabeth; what began in 2011 as two artists sharing a love of Appalachian music has evolved into a visionary project that utilizes visual art, movement, and experimental film. Through their immersive creative process and bold interpretations, Anna & Elizabeth are pioneering new ways of understanding old songs and stories.